NSW Minister for the Arts, the Hon. Don Harwin MLC has announced Tamworth will be the next host city for Artstate, Regional Arts NSW’s celebration of arts across the state. The event will take place from Thursday 31 October to Sunday 3 November 2019. “Tamworth is an authentic Australian heartland beating with rhythm and talent. With its deep roots in music and live performance, it was only a matter of time before it was sighted as the perfect host for Artstate,” said Minister Harwin. 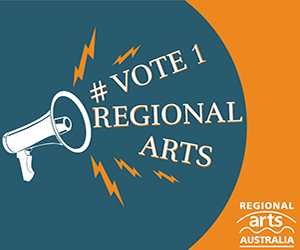 “Regional Arts NSW is delighted to welcome Tamworth Regional Council as our local government partner and Arts North West as our co-presenter for Artstate 2019,” said Regional Arts NSW CEO Elizabeth Rogers. Artstate features a conference program with keynote speakers from around Australia and overseas which runs alongside an extensive arts program highlighting artistic talent from around the region. To checkout the program at Artstate Bathurst, visit: www.artstate.com.au for details.